The purpose of Religious Education is to catechize parishioners of all ages, and to oversee their preparation for the sacraments. Religious Education oversees Children Religious Education preK-5th grade, Edge for Middle School, Lifeteen for High School, RCIA for those becoming Catholic or fully initiated, and Adult Faith Formation. Deacon Frank Rodriguez is the Director of Religious Education. Cathy Fichtel is the Youth Ministry Director for Lifeteen and Edge. Fill out online or download form and bring to the Religious Education Office for payment when convenient. This form is for all levels of Religious Education from prek through high school and for Confirmation. Click Here to register for any level. Are you a non-Catholic going to Sunday Mass with your spouse and enjoying the bond of shared worship? Is the Liturgy of the Eucharist a mystery but something you take on faith? 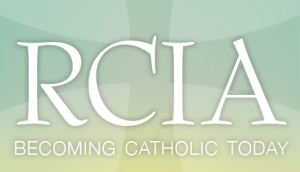 Our RCIA (Rite of Christian Initiation of Adults) program can help you or someone you know learn more about our faith. Cllick below for information on Religious Education for adults and how to enroll.